Guys, these are amazing! I just got them in the mail. The (real) leather is soft and yummy, the sole is nice and squishy and I love all the cute detailing. 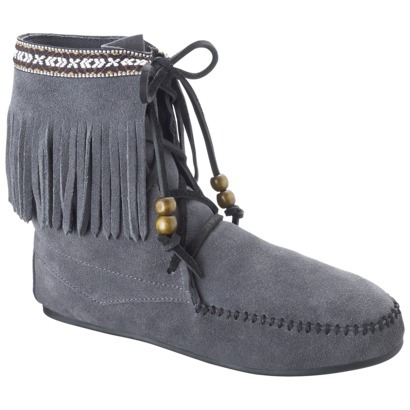 These are so similar to real minnetonkas! Run don't walk to their website to get yours! Good quality for a freakin steal... my kind of deal right there. PS: They come in brown and black for $17.49!!!!! AND if you have a target debit you get 5% off all purchases and everything you buy online ships for FREE! allowing the muscles to end your nerve pain. Other omega-3 rich fish include mackerel, sardines and salmon, mackerel and tuna.